This message was preached by Colin and Navaz D'cruz at Word of Grace Church on the Occasion of Friendship Sunday on August 5th, 2018. To listen/download the audio please click here. To listen to the Sunday's worship and prophetic contributions please click here. We all have friends. But they are not all the same. 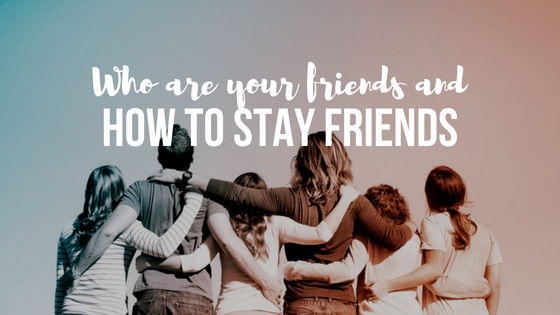 There are 3 types of friends and these tools will help you handle different types of friends. 1. Close Friends/ Confidants: They are your friends because they care about you. They are with you through thick and thin. They are happy for your success. They are with you even when you have blown it. They are with you because they care for you and love you. You can’t have too many confidants. You have a few. 2. Colleagues/ Constituents: they are with you because of a cause or a purpose. They want to be with you to reach their own aims and purposes. In life we have many of these people. they are your friends for a season, to help accomplish their goal. If someone else can help them do that, they will leave you and go to them. Colleagues are like scaffolding to a building. They are essential for a building until the project is completed. Once the project is completed they go away. The confidants are there for you, but the constituents are there for what you are for. 3. Comrades: they are with you because of what you are against. You are together to go against something. People protesting for something are comrades. In life we must know how to distinguish between the three. We need to know which friend is which. Never share your confidences with a comrade. How many of you have fought with your friends? Often, we wear many masks to protect and hide ourselves in conflict? · Conflict is having a difference of opinion on a situation. · In conflict you can agree to disagree and still be friends. Your friends do not have to agree with you on everything. Q. Is Conflict good or bad? Conflict is Good! “Faithful are the wounds of a friend; but the kisses of an enemy are deceitful.” Proverbs 27:6. Would you prefer that your friend tell you the truth or give you the wrong advice to protect your feelings? · Conflict brings to the surface things that are otherwise not spoken about. · Conflict is a necessary part of resolving disagreements. It is a win-win disposition. · Conflict helps to build bridges rather than walls. · There is honour and respect given in the interaction. Respect is always given, trust is earned. That’s why we need to know who are our confidants, constituents and comrades. But respect is given to each and every person you come into contact with. · The desire is reconciliation in order to keep the connection and relationship intact. · Don’t talk about it to the person. · Talk to someone else about it. · Sweep it under the carpet. · Pull rank – younger person cannot give the older person any feedback because cultural norms of respect. Some cultures are very verbal, whereas some cultures are silent. It is good to recognise how do you handle conflict. Q. When does conflict become unhealthy? When we turn from the situation and turn onto the person. In conflict, the disagreement is with the situation. In Strife, the disagreement is with the person. It becomes personal. · Grudges and un-forgiveness held for a long period. · The situation is no longer the issue. The person is the problem. It changes from “we have a problem” to “You are the problem”. It gets personal. · You attack the person’s character. · Seeks war and revenge- this is when conflict is completely broken down into strife and people cannot talk to one another. Q. How do we handle Conflict? · Cool off. Don’t talk when you are upset. Maybe you’ll have to tell your friend that you want to talk about it later. · Talk about the problem not the person. Identify the issue. · Listen and say back what you have heard to make sure you have understood the person accurately. We call this reflective listening. Disagreements do not have to swell into something more unpleasant. After all, we are all different- People with different opinion, wants and needs. LET’S LEARN TO DO CONFLICT WELL!! Q. What is the biggest thing your friend can do for you? The ultimate thing someone can do for you is to die for you. This is a big deal! But I want to share about someone who has died for you and that person is Jesus Christ. Jesus came to save us from our sins and to be our friend forever. Jesus came on this earth and died on the cross. The universal problem that man is dealing with is our sin. But Jesus came and died to pay for our sins. And he says, if you believe that I died for your sins and rose again on the third day, you will be forgiven. And he doesn’t call us servants but friends. This Jesus is available to you today!